This was a quick out and back to Utrecht for the Werkgroep 1501 tour to the ZSLM preserved line at Kerkrade. Infuriatingly ZSLM can only go as far as Vetschau, a mile or so short of the DB main line into Aachen, but it was as much of the closed Maastricht to Aachen route as could be done, so off I went. If I’m honest I was quite interested in the ex LNER haulage as well! Not to mention Utrecht’s Sneltram which though not strictly required track, had been a bit of a niggle for quite a few years. Back to the Netherlands this time, for the first time for some years. After a quiz defeat last night (seems a familiar phrase) the long suffering H (seems another familiar phrase) took me to Shifnal for the 0647 dogbox to Wolverhampton (we’d cut it too fine to make 0642 from Telford) which made it to Wolves in time for the 0719 Euston. Having been assured by the Virgin platform person that my Saver to Birmingham Irrational was OK I travelled on to New Street where ‘your train manager Lee’ assured me that it wasn’t. Accordingly I baled out just in case and completed the journey on a 323 arriving at 0805. Having lashings of time to spare I opted to walk up to T2 to find out how long it took (10 minutes including the detour round the under-construction ‘public transport interchange’ at the end of the funicular). Having checked in at 0825 for my 1030 flight [scarred by long experience of commuting the same route I’d set out with ample time to spare!] I tottered back to the station to watch the trains go by for a while. I was rewarded with class 92 ‘Vaughan Williams’ on a freight and a 90-hauled, blue and cream part Pullman part ancient MkII set whose name temporarily escapes me. It was on a Ryder Cup-related special. Back at the airport eventually, Maersk’s 737 left near enough but queued for a while to take off. Fairly cloudy but a nice view of Aldeburgh! I passed up the egg mayonnaise sarnie in favour of a cup of coffee… Landed at AMS at 1230, again near enough and after picking up a phone message from Herself, made the 1257 stoptrein to Lelystad with ease, changing trains and levels at Duivendrecht for the 1324 stoptrein to Utrecht CS. At Utrecht I made my way via a shopping centre, the VVV (hard to find, not a good trait in a tourist office) and no 11 bus to the Hotel Ouwi which is pretty darned ornery for €67, but that’s what you seem to pay in the Netherlands. The freshly varnished bathroom door was still tacky! Back to town on foot (½ hour) in case of bus problems tomorrow though they seem to be fairly frequent. Breakfast starts 0730 so I should just be able to get breakfast and make the tour. After a refreshment stop and some advice from a friendly bus station person on how the Strippenkaart works (1 strip for every zone in which you travel, plus one, and you fold it so that the composteur stamps the last one you want to use) I set off to do the Sneltram system. Out to Nieuwegein Zuid first, back to Nieuwegein Stadcentrum then out to Ijsselstein Zuid. Ijsselstein is a dreadful featureless overspill/dormitory place, best avoided. 7 minutes was quite long enough. The whole system is pretty much vanilla and I was glad I’d never (including this time) gone out of my way to do it. Mostly roadside on reserved track, and nice modern trams with cloth seats (albeit Connex’s bilious green exterior is a bit iffy). 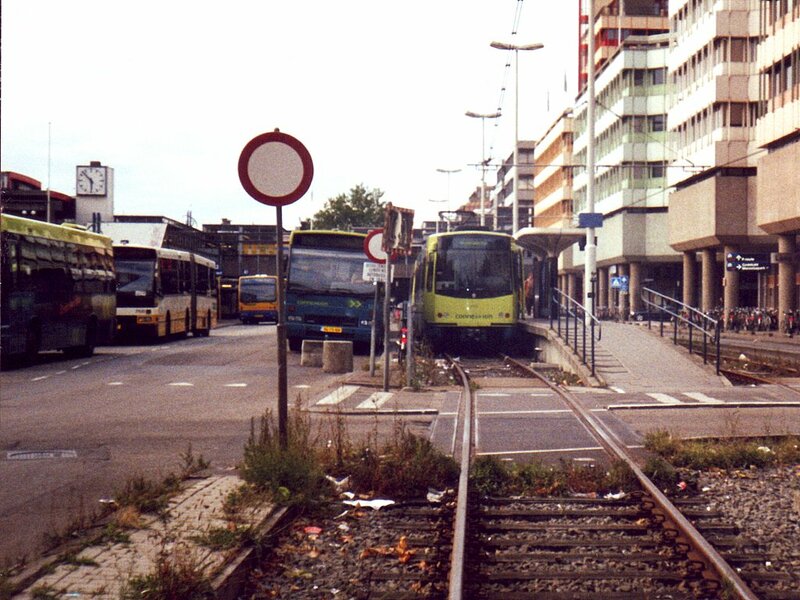 Slightly odd arrangement at Utrecht CS where the eponymous tram stop is opposite the north end of the railway station. The final stop (name escapes me) is opposite the south end of the station. The line continues about 100 metres with a scissors crossover just after the platform (which is an island, like ‘Utrecht CS’). As there is, technically, a split alignment between the two tram stops (there’s a road between the two tram lines) I returned to ‘Utrecht CS’ on the same tram in order to complete the system. It being 1815 by now there was clearly no alternative to beer and food. First port of call was the Oudaen home brew pub beside the cut at 99 Oude Gracht. Three beers; an unfiltered white (Ouwe Daen), filtered white (Jonge Daen) and lager (Linteloo Gold). I had the surprisingly malty tasting Ouwe Daen, which was very pleasant if expensive at €2.50 for what appeared to be 33cl, nearly £3/pint. Onwards to Belgie at 196 Oude Gracht. This took some finding as Oude Gracht turns into something else as you head south. However it eventually returns if you stick with the canal and I was rewarded with a most excellent pub. Highlight was draught La Chouffe, also tried De Leckere Tripel, a local substance like a gueuze in that it tried to take the back of my throat out, and made me cough and cry for a couple of minutes! Unlike a gueuze it didn’t get better though, so best avoided. Apparently the ‘brewery’ was in Utrecht, has now wisely moved 5km away, but may shortly return. I wouldn’t bother, meself. Final port of call was the Florin and Firkin in Nobelstraat, only the second time I’ve been to a ‘British’ pub abroad. They’ve got British dreadfulness to a T. No draught beer (as the only clip visible said 8%, possibly just as well). Tables filthy, generally very British – except the staff were polite! Settled for a Dommelsch pilsener, which was fine. Back to the Hotel Ouwi for an early night having managed (accidentally) to pass by a quite amiable looking brown bar which I’d clocked earlier. Decided to try for breakfast at 0720 and found it just appearing (ham, cheese, boiled egg, toast) so I was able to get 0745 bus with reasonable ease and be in town for 0800. Quick look round the market (excellent) and a precautionary visit to a shop to get emergency beer supplies in case the tour buffet didn’t sell beer until later (it didn’t, so a good call even though it’s Grolsch). The tour turned up a bit late, comfortably un-full, with two 1501s - one Dutch, one Belgian - which was a nice touch. Apparently the Belgian 1500s are in reserve at Kinkempois, shortly to be withdrawn. Very leisurely progress so far, with NS1501 taking some time to run round at Den Bosch (pronounced Sair-togen-bosh as far as I can gather - always wondered!). [NS 1501 was of course an LNER designed, Metropolitan-Vickers built class EM2, known in its BR days as 27003 'Diana'.] We passed a kettlex at Weesp with Kriegsloks front and rear. A 52 at the north end, and a 50 at the south end. 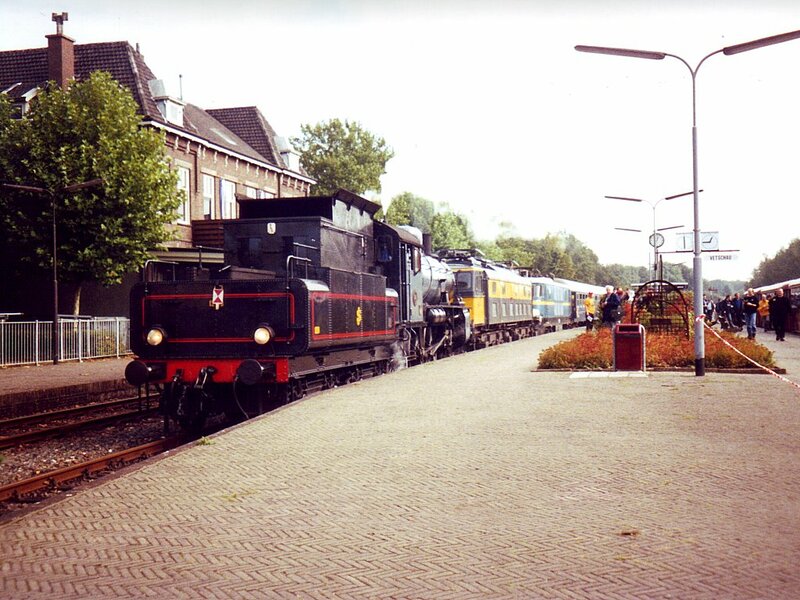 The tour train at Kerkrade, with ex SJ (Sweden) 2-8-0 1040 leading ex-NS Co-Co electric 1501 (ex BR class EM2 27003) and SNCB/NMBS electric 1501. Despite the lethargy we were near time at Weert but 8 late again when we paused at Haelen to let an IC past. That too was late so the Roermond phot stop was abandoned and we passed there on time at 1048. 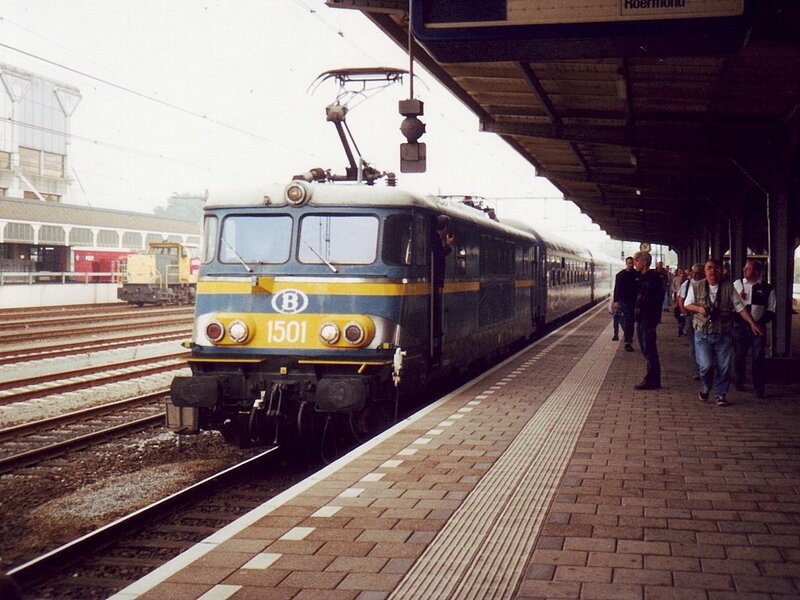 A half hour stop was made at Sittard during which 1501 (NS) made its way to the front of the train. On then to Kerkrade, where to my surprise the ZLSM kettle, a Swedish 2-8-0, coupled on in front of the two electrics. Sweden, Britain, Belgium and Germany (the coaches) then proceeded through the Netherlands to Simpelveld where we transferred to ex-DB 778/978 plus centre trailer. 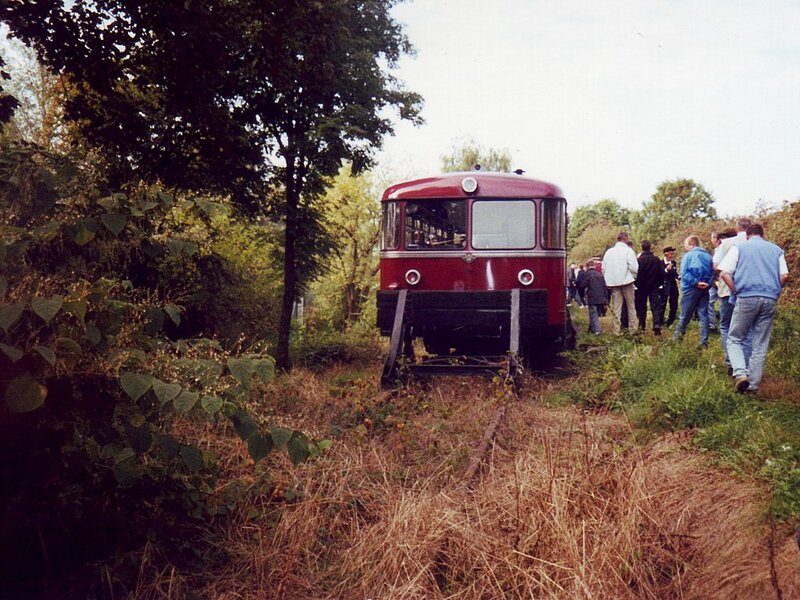 This first went down to Vetschau where there is a buffer stop but track remains in place beyond, towards Aachen. Back then to Schin op Geul with a half hour break at Wijlre to cross the kettle coming the other way with ZSLM’s own three coach red and white set. The opportunity was taken to visit the wholly admirable Brand’s pub across the road (guest beer Affligem Dubbel. Brand’s Imperator and Pilsener were taken; had the guest been Tripel things might have been different!). We transferred to ZLSM's German Ferkeltaxi for part of the tour. It's seen here just inside the German border at Vetschau on the former line to Aachen. The ferkeltaxi returned us, with two photostops (one a run-past) to Simpelveld where the excellent refreshment room dispensed Brand’s Pilsener. As did the one at Schin op Geul, but it does come from Wijlre so you have to forgive them. Return to Utrecht was via Maastricht where the station buff sold Brand’s so we retired across the road for Leeuw Pilsener. Pleasant enough though not likely to set the world on fire. Might put it out I suppose. At Utrecht the day’s rail travel ended - DM and I retired to Oudaen for a repeat sample of Ouwe Daen (see 27.9.02), Wills Café for a rotten meal and a Dommelsch, and finally out into the suburbs to Jan Primus where we were surprised to find Hook Norton ‘Steaming On’ at near British prices. A half was taken, very pleasant too if a little flat, followed by a Hoppenbier which was excellent. I returned to Hotel Ouwi on foot and was tucked up in bed before midnight. Unfortunately for me my neighbours returned by taxi at 0330 and kept me awake intermittently until 0630. I did however much enjoy shaving with a nice noisy electric razor at 0745! With Sneltram done, nothing for it but to make my way quietly back to Schiphol for what I fondly believed to be the 1330 flight. Uneventful journey, picking two ICs for the journey just for the sake of comfort. I arrived at Schiphol at 1045 to kick my heels for even longer than I thought, the flight being at 1345! Still, I’ve brought next weekend’s Plandampf timetable with this in mind, so I can do some work on that. A good bit of BA (or was it Schiphol?) incompetence followed. Loaded on to the bus at around 1330 we sat until 1350 without any information (booked departure 1345). Once aboard the aircraft the captain informed us it was due to the failure of the booking in system at the gate – certainly this was being done by hand instead of the usual machine. The irritation was compounded by Victor Meldrew who knew everything there was to know about BA and flying (so much so that he identified our Canadair CRJ200 as a turboprop), informed us all that we were delayed because of a serious problem on the aircraft, didn’t like the lemonade his long suffering wife gave him because it had an additive, and so on ad nauseam. Scheduled airlines were a ‘rat race’ in VM’s opinion, quoted several times. Before one of his fellow passengers kills him, may he get to fly with Ryanair. Perfectly capable of being VM myself, at least I don’t inflict it endlessly on an aircraftful of passengers. Anyway, once off the ground we had a pleasant enough flight on the Canadair Coke can, arriving BHX 15 late at 1415, still in plenty of time for the 1440 VWC to Wolves, which was the best I could hope for anyway, since I wasn’t going to get the 1402 local off a 1400 arrival. Back at BNS I watched, unknowingly, a Salop train go and proceeded to Wolves where the Great Western had just shut. Back therefore to Wetherspoons where Golden Thread and Abbot passed half an hour. Wales & Borders, bless ‘em, turned out the 1557 parliamentary to Telford on time. The following weekend Mrs EG and I, together with a friend (and Victor Meldrew's cold) went off to another German plandampf, based around their Reunification Day bank holiday (October 3rd) weekend.